DESCRIPTION JUST REDUCED. 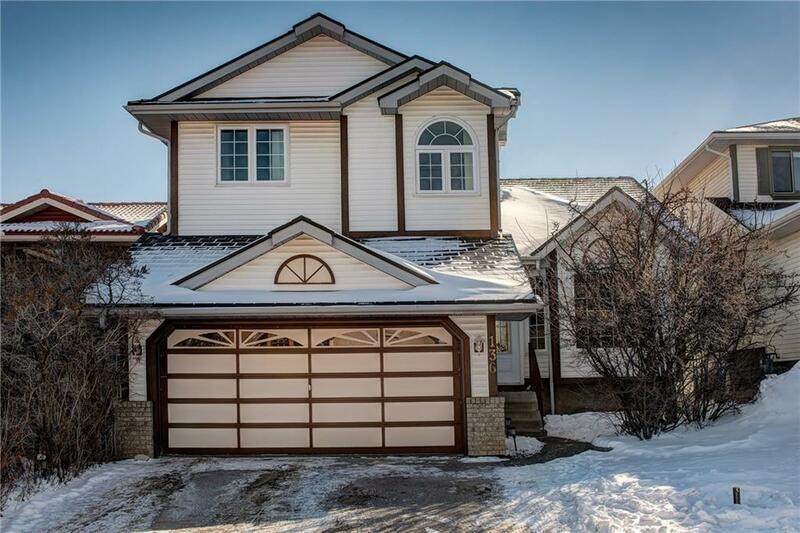 Great family home,fabulous location,walk to Sunterra plaza & C-Train,10 mins to Downtown,easy access to Ravine across the street plus amazing views over the City to enjoy a spectacular sunrise. Beautifully updated,this spacious plan offers new commercial-grade flooring to stand up to all your family's activities,newly painted throughout for a bright and cheerful living space,flooded with light through the formal living/dining room & into the open living room with wood burning fireplace,sunny kitchen,new granite counters & nook leading to raised deck to enjoy the south facing view.Upstairs an expansive master enjoys walk in closet & spa like renovated ensuite,heated tile floors,double vanities,Ultra Bain soaker tub with air jets & heated backrest & Thermasol Steam shower with Aromatherapy ports.Two further sunny bedrooms & family bathroom.Finished walkout basement gives space for family /rec-room & den would make a great teen bedroom. Furnace,windows,electrical panel,roof & water softener are all updated.